The RUC officer claimed that he only opened fire when Jordan turned around ... Forensic evidence, however, later showed that Jordan was unarmed and that the rounds that killed him all struck him from behind, hitting him in the arm, shoulder and the back. 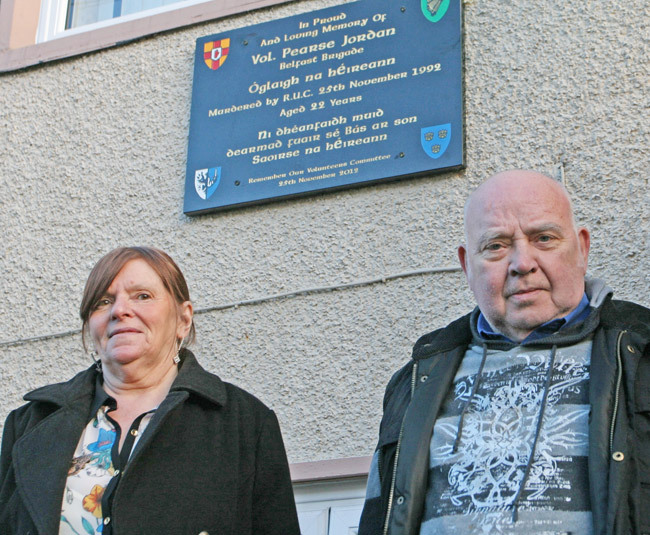 WITH the inquest into the RUC killing of unarmed IRA Volunteer PEARSE JORDAN in Belfast in 1992 failing at the end of this October to reach agreement on key aspects of the case, Pearse’s parents, Hugh and Teresa, are accusing the state of prolonging the cover-up. An Phoblacht’s PEADAR WHELAN looks at the killing, the lies and the cover-up and finds that Britain’s ‘Dirty War’ continues behind closed doors 20 years after Pearse was shot dead by the RUC. WHEN IRA Volunteer Pearse Jordan was summarily executed by the RUC on 25 November 1992, few would have believed that the circumstances surrounding his death would still be the centre of controversy 20 years later. The North’s judicial system — particularly the Coroner’s Court — has failed to provide Pearse’s family with any satisfactory answers about their son’s death. It shows an unwillingness by officials to properly investigate the actions of the RUC on the night of the shooting. And despite a 2001 ruling by the European Court which declared that Pearse’s death was in violation of Article 2 of the European Convention on Human Rights (“everyone’s right to life shall be protected by law. No one shall be deprived of his life intentionally”), the Jordan family’s suspicions that they will never get justice remain. 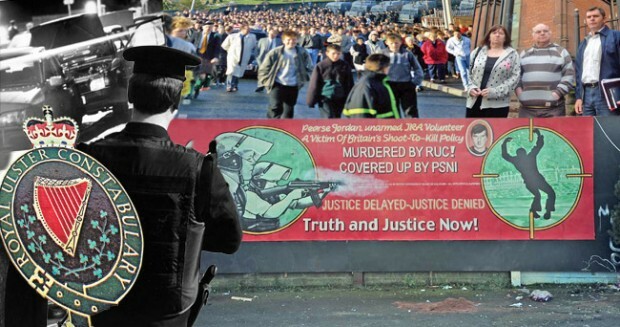 On the one hand, the actions of the RUC (particular, those of Sergeant ‘A’ on the night of 25 November 1992) are key to the events that the Jordan family want to unravel. On the other, there is the refusal of the British state to disclose the documentation it has so far withheld from the family’s legal team as it continues to cover up Pearse’s killing. 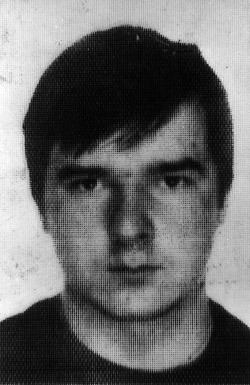 An Phoblacht can confirm that Sergeant ‘A’, the man who shot Pearse Jordan dead, was a radio operator involved in an RUC shoot-to-kill operation in Armagh during 1982. According to legal figures close to the Jordan case, ‘A’ had been monitoring radio transmissions during the RUC operation that left INLA Volunteers Seamus Grew and Roddy Carroll dead. He admitted (while giving evidence from behind a screen at the inquest into Pearse Jordan’s death in October this year) that he made false statements in relation to the Armagh killings. Other RUC men involved in debriefing ‘A’ after the Jordan shooting were part of the RUC’s controversial Headquarters Mobile Support Unit (HMSU) that carried out the killings of six men in the Lurgan/Armagh City area of north Armagh in the early 1980s. It has also emerged that ‘A’ refused, over a 10-year period, to give evidence to the Coroner’s Court although he has since appeared to give evidence. ‘A’ lives abroad and has previously maintained his refusal to appear was due to his fear his identity would be revealed. But it has now emerged that in the years he was refusing to attend court he was travelling to the North and taking part in public functions involving senior RUC officers. Indeed, at one such function, celebrating the 30th anniversary of the formation of the HMSU, ‘A’ was given an award at a black-tie dinner attended by senior PSNI personnel. It was further disclosed that ‘A’ told a doctor that his job was “great until the ceasefire”. The 1992 killing of Pearse Jordan happened on the Falls Road in Belfast as the 22-year-old IRA Volunteer was driving citywards in a car commandeered by the IRA when it was rammed by an armoured RUC vehicle. As Jordan staggered from the red Ford Orion and ran across the Falls Road, Sergeant ‘A’ opened fire. Three rounds from a burst of five fired hit Jordan in the back, fatally wounding him. The RUC officer claimed that he only opened fire when Jordan turned around and he “feared he [Pearse Jordan] was going to shoot” him. Forensic evidence, however, later showed that Jordan was unarmed and that the rounds that killed him all struck him from behind, hitting him in the arm, shoulder and the back. ‘A’ also claimed that the RUC vehicle he was behind and from where he fired his shots blocked his vision of the victim’s full torso. Forensic evidence, the position of spent cartridges and the entry wounds question this and suggest that ‘A’ had a clear view of Jordan when he opened fire. An Phoblacht has also been told that, contrary to RUC regulations, ‘A’ had a bullet in the breech of his weapon when his unit left Andersonstown Barracks in pursuit of Pearse Jordan’s car. He further admitted that if he had been called to give evidence in the trial of an RUC colleague charged with murder he would have lied in court. Despite these admissions, ‘A’ rejected the barrister’s assertion that he was also prepared to lie about the shooting of Pearse Jordan. He also denied suggestions from counsel that he had shot the unarmed man knowing he posed no threat. “My recollection of what happened on the night is what I have said previously,” ‘A’ insisted. Four civilian witnesses also contradicted ‘A’s testimony. Their statements stated that after the Orion driven had been rammed, Pearse Jordan got out of the car, shaken, and staggered across the road towards the witnesses and followed by RUC officers. Sergeant ‘A’ fired from about 12 feet away. The eyewitnesses are emphatic that no warning was shouted nor did they see anything threatening in Pearse Jordan’s actions. In the years after their son’s killing, Hugh and Teresa Jordan have relentlessly pursued the truth about Pearse’s death. For them it is a clear case of summary execution, a case where the RUC ambushed and shot their son dead rather than conduct an arrest. 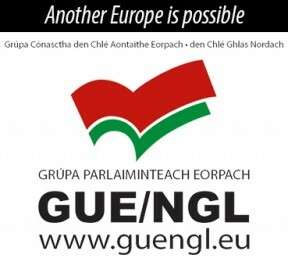 Their perseverance led them to take the case to the European Court of Human Rights (ECHR) in 2001. The ECHR found that Pearse’s family’s rights were violated by the flawed inquest procedures and ordered the British Government to compensate them. As a result, British law regarding inquests was changed. One important change has meant that members of the British crown forces can now be compelled to give evidence whereas before the 2001 ruling they simply refused to attend proceedings. Despite these limited advances the problems for the Jordan family and their campaign for truth goes on. In the latest round of hearings, which began on 24 September and concluded at the end of October, Coroner Brian Sherrard accepted the limited findings of the jury, namely that Pearse was shot dead on the Falls Road in November 1992. The jury could not agree on the key issues surrounding the shooting. The Jordan family barrister, Barry MacDonald, described the coroner’s decision as “quite wrong” and said it would masquerade as a verdict. The difficulty for a coroner is the fact that, unlike England and Wales, where a majority verdict is acceptable, inquest juries in the North must reach a unanimous verdict. The Justice and Security Act (NI) 2007 also guarantees anonymity to jurors, making it illegal for barristers to question a potential juror about any possible bias they may hold. The Jordan family’s barrister asked the coroner to remove the juror concerned, claiming the note showed the juror was “clearly vexed” and was incapable of assessing the evidence in the case dispassionately. The barrister said it was clear the juror’s mind was already made up and he expressed concern that the juror may have unduly influenced other members of the jury. While Coroner Sherrard refused to dismiss the juror involved, he did issue a warning to the jury that they should only make up their minds after having heard all the evidence in the case. He said that any juror who did not feel they were able to act impartially should make themselves known to him so that they could be removed. No juror did so and the panel remained unchanged for the entirety of the inquest. In the inquest into the killing of Volunteers Dessie Grew and Martin McCaughey, held earlier this year, a juror who had shown hostility to the men’s families’ legal teams was also said to have spat at members of the men’s families. Clearly there remain many challenges ahead for the Jordan family and others seeking redress from a legal system that has more to do with maintaining a corrupt status quo than dispensing justice and uncovering the truth.